First, the project cycle of a prefab shelter is incredibly favorable for an urban environment. As everyone knows, it seems like major construction is happening every 100 feet, and it these large projects can create a major inconvenience for everyone in the area, clogging traffic and creating lots of noise. However, in the case of these shelters, the hard part is taken care of in a manufacturing facility offsite. This way, the only part left to do at the project site is to anchor it to the ground. Since these shelters are often found right off the roadway, the speedy installation keeps traffic disruption to an absolute minimum. Second, many cities will try to keep a consistent image or design style in particular neighborhoods. Using a prefabricated structure, the manufacturing facility can consistently produce multiple structures that are identical in every way. This consistency ensures all of the area’s shelters have the same quality and design. Third, prefabricated shelters require little to no upkeep to maintain. For Panel Built, our prefab shelters utilize a welded steel design that is powder coated to the customer’s desired color. Ultimately, this helps ensure the shelter will be able to stand up to harsh weather conditions and will not lose paint as easily due to debris, dings, or general wear and tear. As mentioned previously, prefabricated shelters are primarily used as bus or mass transportation shelters in city/urban environments. Typically, these can be found outside of residential areas, retail stores, offices, etc. In order to not disrupt foot traffic on the sidewalk, they can typically be found on a concrete slab just off the sidewalk. These shelters can come with a number of amenities that some might not even relate to a typical sidewalk shelter. Lights, windows, electrical outlets, or even fully enclosable sliding doors are all available to add on. Similarly, with the implementation of public smoking laws over the past decade, outside smoking shelters have become more popular. These structures offer people the ability to have a smoke in an area that will not be offensive to non-smokers, while at the same time providing them shelter from any harsh weather elements like heavy rain or snow. These systems come in a variety of designs and can be set to match the architecture of the surrounding buildings and environment. Again, with the Pay on Foot version of our prefabricated shelters, the structures are often being used in the transportation industry. In this case, pay-on-foot shelters are typically used in paid parking areas. These shelters are popular in urban areas for a few reasons. First, they provide great protection for the Pay-on-Foot machine which offers the city a way to protect their investment. Second, it offers a shield from the elements for the operator of the machine. And finally, the big structure can offer an easier way for the public to know where to pay for their parking. Our final application example is the first that you is not primarily found in an urban environment. Like the Pay-on-Foot Shelter, equipment shelters function mainly as a way for a company to protect their equipment and sometimes people who operate the equipment, from the elements. Our shelters’ welded steel fabrication technique ensures that each equipment shelter is heavy duty and capable of withstanding even the most intense weather thrown its way. With all the applications prefabricated shelters have, there a number of design variations that fit each application. For many prefab shelter manufacturers, cookie-cutter designs and materials used to restrict the structure designs available to the customer. Panel Built’s welded steel shelters offer an incredible amount of customization with designs that are manufactured 100% to customer specification. Similarly, to our modular buildings, our prefabricated shelters can be designed to fit city environment around it. Overall, the design of the shelter will depend on its application. For example, our bus shelters offer a full 360-degree view with no blind spots. This increased visibility allows pedestrians to see when buses are arriving, or allows for increased awareness at night. However, the Pay-on-Foot shelter would be much smaller, and might not have windows at all to protect your privacy while you are paying for your parking. It all depends on the application. Additionally, we can also design the shelter using our wall panel system. In this case, the prefabricated shelter would act similarly to one of our exterior buildings except with only three walls. By powder coating our prefabricated shelters, the structure gains a number of advantages. First, Panel Built, Inc. is able to color match to any color that the customer requests, so the project will not be limited to standard color options. Second, powder coating is one of the most durable color finishes available today. 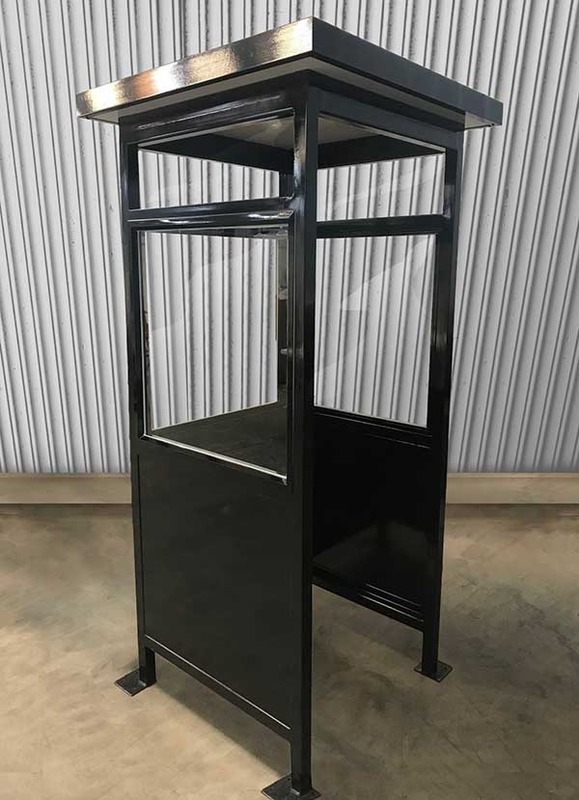 Using powder coating, the structure is allowed to be coated with a thicker layer than a liquid paint alternative and does not cause any running or sagging on your finished product. For more information on our heavy duty prefabricated shelters, give us a call at 8006363873, request a quote, or send us an email at info@panelbuilt.com.